Welcome to another episode of #ThatBusinessShow with your host, Jamie Meloni. Thank you for your support of this show, we are running now for two years! #ThatBusinessShow has seen now over 300 guests, and we have done hundreds of shows as well. All of the guests and shows can be found on http://www.tampabayradio.com. Also, you can visit my YouTube channel to see any of the livestreams on demand at http://www.youtube.com/jamiemeloni. Thank you for joining us for two years now, and here’f for more time on the air to come! 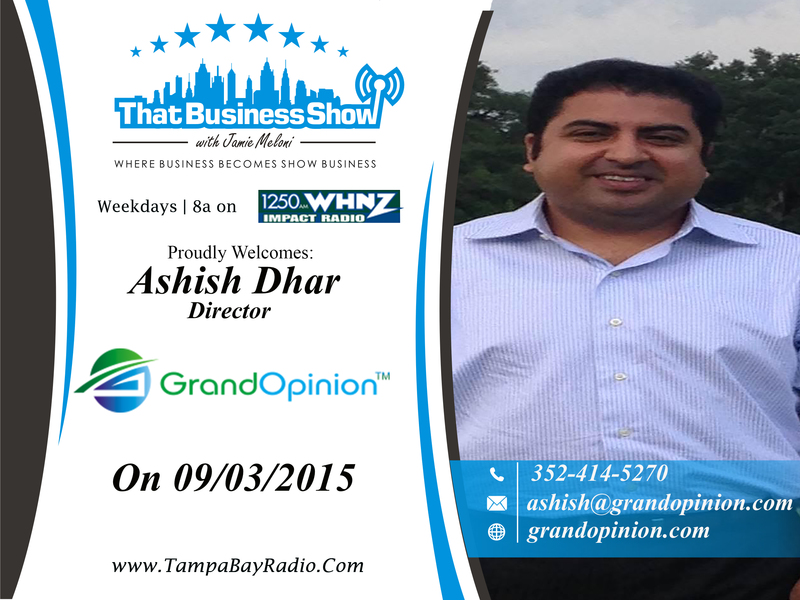 Today on #ThatBusinessShow, we had Ashish Dhar with Grand Opinion. Grand Opinion is quite the unique health solutions company, connecting people globally. On the last half of the show, Rick Tauceda, Josh Vozda and I spoke about the history of this show, and they told our listeners a little about themselves. We had a great show today on #1250whnz, and remember that every weekday at 8am, #ThatBusinessShow can be found on the air at #1250whnz, or online at http://www.tampabayradio.com! Joining Jamie Meloni today was Ashish Dhar with Grand Opinion. Grand Opinion is a way for people all around the world to get access to medical specialists in many various fields. Grand Opinion offers second opinions of medical diagnoses and procedures to the patient who isn’t too sure about their prognosis. Ashish connects these patients to specialists all over the nations who use their knowledge to give their opinion on what the patient is suffering from and how to properly treat that ailment. The main goal of Grand Opinion is to avoid the tragedy of misdiagnoses. Ashish started Grand Opinion because of a death in his family causes by a misdiagnosis. The belief of many physicians is to collaborate and work for the health of the patient, with many opinions granting better rates of success. What’s unique about Grand Opinion is that it offers people around the world access to american medical specialists, something people immigrate to america for. Western medicine saves lives in countries where the local physicians don’t have the knowledge to properly diagnose people with ailments, therefore Grand Opinion is a lifesaving company. Ashish spoke to us about the future of his company, which will eventually go into the telemedical field. You can learn more about Ashish Dhar and Grand Opinion at http://www.grandopinion.com or contact him at 352-414-5270 or at ashish@grandopinion.com. As #ThatBusinessShow has turned two years old, Rick Tauceda, Josh Vozda, and I spoke a little about our history, beginning as a Real Estate show airing weekly, eventually evolving into #ThatBusinessShow airing 5 days a week. Quite the leap from a little hobby. With no experience, Jamie hopped on the air and now has had hundreds of shows where hundreds of guests have come on and shared their experiences and knowledge with our listeners. We also were able to hear some of our resident photographer’s story! 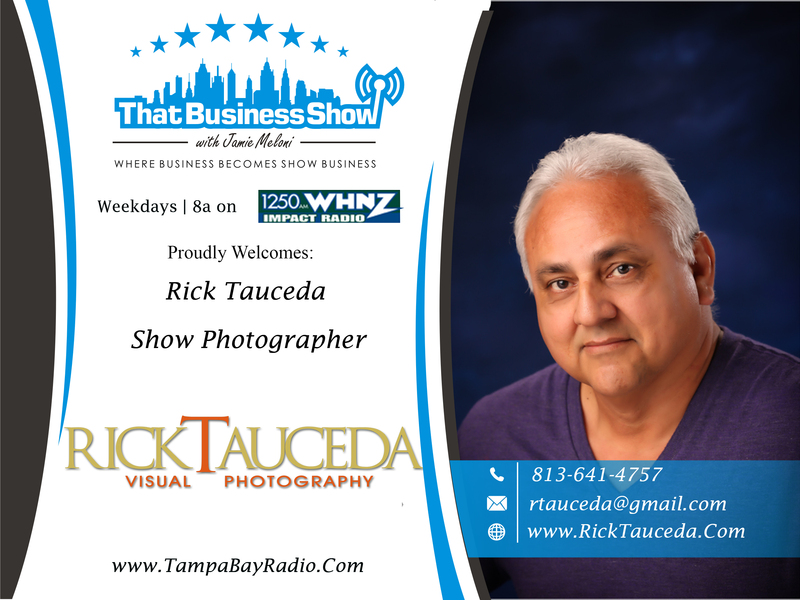 Rick Tauceda is a professional photographer who has had years to master his art, and can be found at http://www.RickTauceda.com or contacted at 813-641-4757.